Educia is Ultra Responsive & Retina Ready clean and flexible Education Courses WordPress Theme. It is very clean and responsive design. This is a powerful theme with tons of customization options and settings. We have added a lot of design features and powerful functionality that you will love. 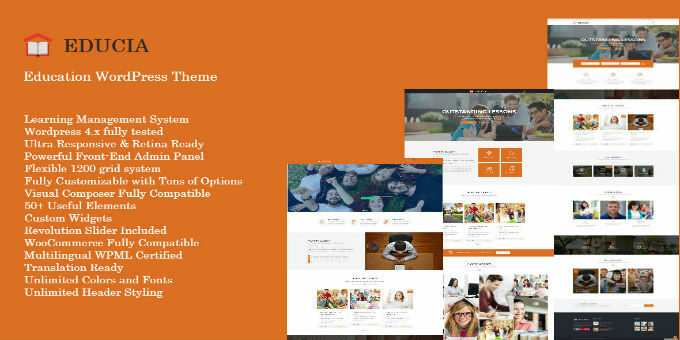 Educia Theme is the best solution for your Online Learning, Courses, School or University website. Included Demo Data and Intuitive Drag and Drop Page Builder ( with 50+ custom elements inside ) will help you to have ready website in few minutes. One Click Demo Installer allows you to install full demo data in seconds. Educia also includes Learning Management System functionality with Powerful Online Courses Management Administration. It has different layouts for blog, portfolio, gallery, shop, courses and events. Start building websites in minutes with Educia WordPress Theme.